The Garmin new smartwatch designed for monitoring physical activity, Forerunner 920 XT, is 15% lighter than the previous model and 18% more thinly. This dispositio of wrist, allowing synchronized with the “smartphone” to notify the user upon calls, emails or text messages. Among other features, it is water resistant to 50 meters deep, making it a multi-sport coach. As activity monitor, new watch provides information on the steps, distance and burned calories, in addition to showing the time. Furthermore, alerting the user when to start up after a period of inactivity and sleep monitors. In water, Forerunner 920XT uses the accelerometer to provide metrics for swimming and is able to provide swim distance, type and number of strokes with the efficiency and cadence. For use on land, the clock displays the time, distance, pace and speeds of the user. And thanks to its barometric altimeter is able to obtain complete data on height. Using the heart rate monitor HRM-Run (not included in the watch), the Garmin “smartwatch” helps the user to monitor the cadence, the heave and the contact time with the ground. It also included VO2 Max system that estimates the maximum level of oxygen that can be consumed per minute per kilogram of body weight. In addition to all of the above, a built-in metronome marking the athlete through vibration and tones the rhythm of strides to follow. The device can also be used on the bike, providing the user with accurate data on the slope and the cumulative altitude, which will be expanded using other compatible sensors of speed, heart rate or ANT power sensors. After completing the exercises, you can synchronize and transfer data to a computer as a ‘Smartphone’ using Garmin Connect or Garmin Connect Mobile, plus share some fitness applications. 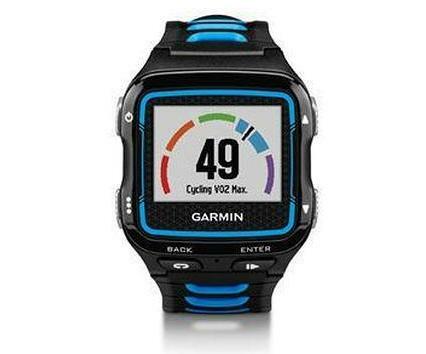 The Garmin Forerunner 920XT has a battery life of 30 days in clock mode and 24 hours when GPS is active, that can be turned into 40 when UltraTrac mode is activated.